We are in the midst of a Stephen King renaissance, where the classic works of the best-selling author once again are fueling adaptations at the cinema at a record rate. Later this year, IT: CHAPTER TWO will conclude a translation of that epic novel, with the children of Derry once again uniting in opposition of Pennywise the Clown. Don’t want to wait that long for a Stephen King flick? Good, because PET SEMATARY is right around the corner, and it’s retelling one of King’s most dark and disturbing campfire tales. PET SEMATARY was a movie once before, adapted by director Mary Lambert in 1989. Thirty years later, STARRY EYES co-directors Kevin Kölsch and Dennis Widmyer take a stab at the undead story, bringing Stephen King’s resurrection thriller to life on the big screen once again. Purists who are expecting a literal translation of King’s novel may notice a few changes to the tale, though. Some of these might also be considered spoilers, so if you don’t want to know much more, bail out now and go see PET SEMATARY when it opens in theatres on April 5. For the rest of you, here are the three biggest changes the new PET SEMATARY makes to Stephen King’s classic book. 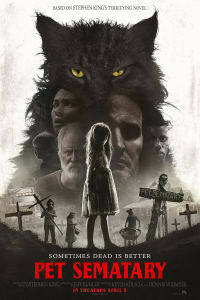 PET SEMATARY tells the story of the Creed family, who moves to a Maine home that happens to be on a busy road. The trucks that barrel down that road claim lives, but behind the home rests a plot of land that magically brings things back to life … with a twist. In both the Stephen King book and the Mary Lambert movie, it’s Gage Creed, the adolescent boy in the family, who gets killed on the road and brought back to life. But in the new movie, Kölsch and Widmyer make the switch from Gage to Ellie Creed, the family’s older daughter. In one aspect, she has a deeper connection to the family cat, Church, who is the first “test subject” in the pet cemetery. But Kölsch and Widmyer also state that by making Ellie the undead, they get an older actress in Jeté Laurence, who is able to give a rounded performance and move the story forward. There’s a significant character in the King book who does not show up in the Mary Lambert 1989 adaptation or in the new movie reaching theatres on April 5. Norma Crandall, the wife of Jud Crandall (John Lithgow), is absent once again in this story. In the book, Norma is the reason that Jud owes Louis Creed (Jason Clarke) a favor. Louis is a doctor, and he saves Norma the night she has a cardiac incident. To pay Louis back, Jud introduces him to the pet cemetery, despite the risks that come with it. Norma is referenced in the new PET SEMATARY movie, but is not present … much. Her absence may annoy fans of King’s book, but in the context of the new movie, it makes sense. Kevin Kölsch and Dennis Widmyer got rid of Norma Crandall, but they increased the presence of another key character, even amping up the amount of time we get with her from the book. That would be Zelda, the deceased sister of Rachel Creed (Amy Seimetz). Rachel is haunted by the pain that still comes from the loss of her sister. She doesn’t like talking about death and hesitates to tell her daughter, Ellie, about death and the afterlife. Zelda gets a full chapter in the King book, but she’s also a major player in the new PET SEMATARY movie (played on screen by Alyssa Brooke Levine). We get several flashbacks of young Rachel’s time with Zelda, which was terrifying, difficult and left a mark on this woman. It’s a wise decision and creates several scenes that PET SEMATARY audiences will be talking about. 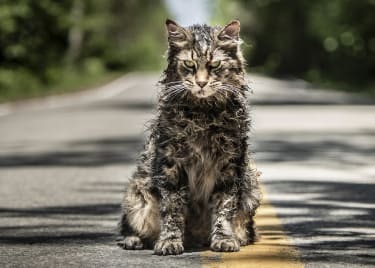 Fans of both the book and the original film will want to see how these differences affect PET SEMATARY when the new movie opens in theatres on April 5.